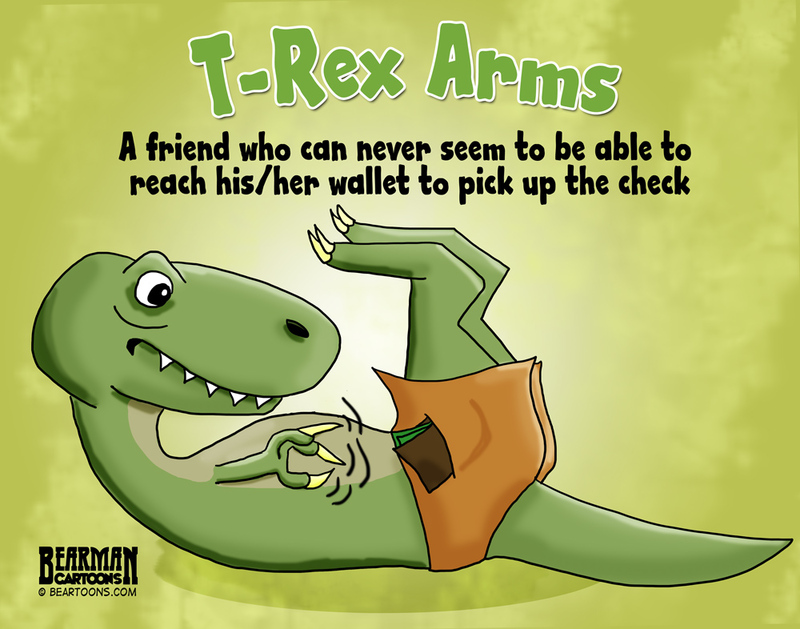 So yesterday’s post on Alligator Arms got some discussion from several people on social media that they had not used the term but instead use T-Rex Arms or Dinosaur Arms to describe someone who is cheap and can’t seem to reach their wallet when it is their turn to buy a round or pick up the check in a restaurant. So I always aim to please. When was the last time I posted twice in a week, let alone back to back days. You are welcome. haha. There you go. Just for you! And now many times have I commented twice on your blog in the same week. Well you know the answer to that. T-Rex would be very unsuccessful at push-ups too. I wonder how they wipe their bum then??? Getting those shorts on wasn’t easy either! Great take on the arms thing!!! Both alligator and t-rex. Well I didn’t coin it but I will gladly take credit for it. The T-Rex is cuter, too. These people should become extinct, too. One shameful day at a time. And I bet he ate more than his fair share of food. They probably don’t play guitar too well either! My brother has those tiny arms. Real cheap! Had to! And mine was encrusted with corn and peanuts! Serves him right! This is SO funny. Can’t stop cracking up. You’ve actually captured the likeness of my ex-boyfriend to a T.
Bearman, not only is this cartoon glowing with your usual genius at artwork, but my ribs are saur from laughing. That is a pretty perfect descriptor. Maybe they need to keep their wallet in a shirt pocket.